As the founder of MissNowMrs, an online name change service for brides, my own name-change misadventures sparked the idea for the company that has now helped over 400,000 women transition from Miss to Mrs. with ease. Not only do I understand state name-change laws from all the research done to create our service, I have a decade of counseling newlyweds on the topic of name change. I’ve fielded calls from doctors, teachers, ladies in their 60s, divorcees, brides with hyphenated last names marrying men with hyphenated last names (facing the reality of FOUR last names,) individuals handling cultural expectations from their heritage (did you know it’s illegal for a woman to change her name in Greece?) and many more! I didn’t set out to be a name-change expert, but my experience has made me the official married name change expert. I’ve ended up on FOX Business News, KTLA, and NBC to discuss the in’s and out’s of married name change and my tips to streamline the process. I recently read about a bride-to-be who is named Shannon. 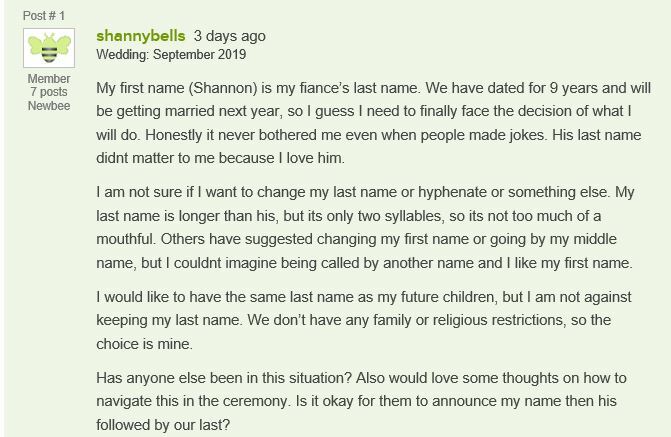 She is getting married in September to the love of her life… who happens to have the last name Shannon. So, Shannon is facing the reality of possibly becoming Mrs. Shannon Shannon! She posted her situation on WeddingBee and advice has been pouring in. As a name-change expert, I would love to weigh in. We’ve seen a large up-tick in women taking two last names without a hyphen in the last 12 months. This option allows one to use both names, or either name as they see fit. So you can avoid the mouthful of hyphenated last names, but still have the same name as your children. Many newlyweds see it as having the best of both worlds. This might be a great option for Shannon, but again we’d love to ask a few questions to give an official recommendation. So, Shannon… if you’re reading this, please call or text the MissNowMrs office at 800.301.9296. We’d love to ask you a few questions and lend our expertise along with a gift card to use our online name change service or our new Name Change App when you’re ready to make the switch to the version of Mrs. that suits you and your life best! The entire MissNowMrs team wishes you a lifetime of love, happiness, and adventure! 3 Tips to Make Your Name Change Decision A Snap! Taylor Swift Married Name Change? !